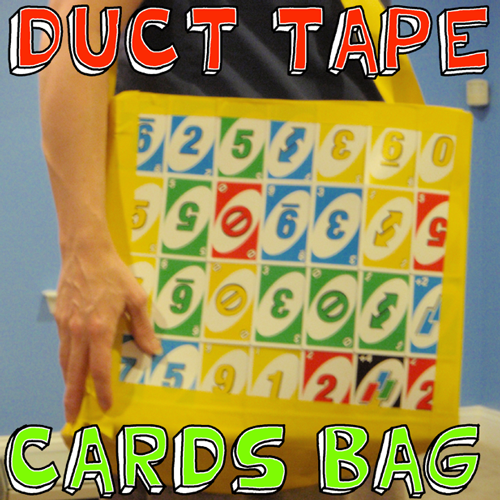 Check out our other Duct Tape Crafts. 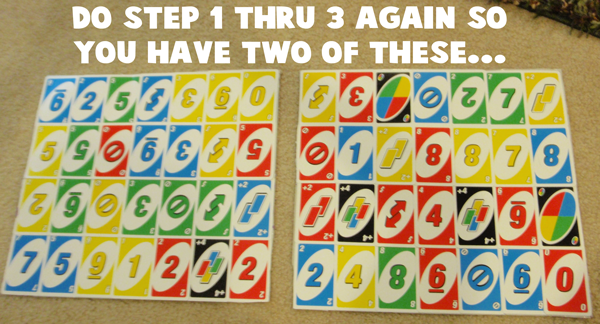 Duct tape these cards together. 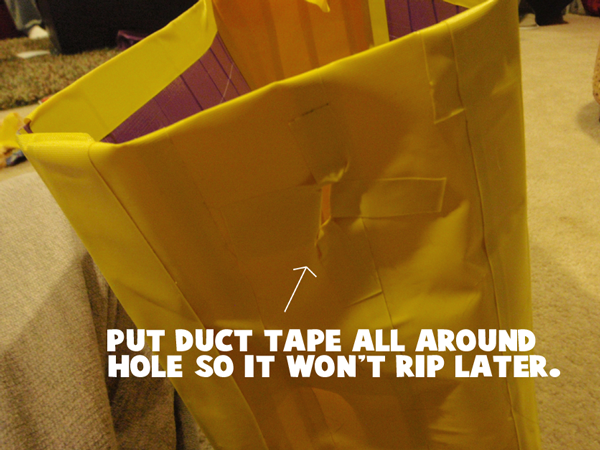 Do this 4 times and then duct tape all together… Like this. Duct tape only one side. 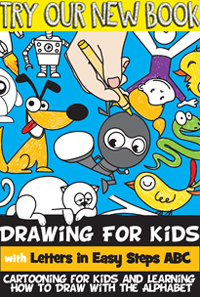 Do step 1 thru 3 again so you have two of these. 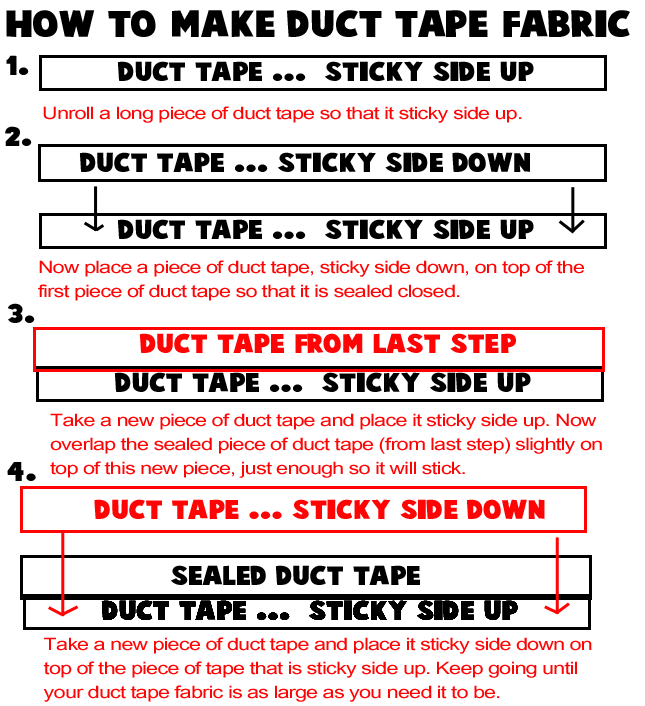 Unroll a long piece of duct tape so that it is sticky side up. Now place a piece of duct tape, sticky side down, on top of the first piece of duct tape so that it is sealed closed. Take a new piece of duct tape and place it sticky side up. Now overlap the sealed piece of duct tape (from last step) slightly on top of this new piece, just enough so it will stick. Take a new piece of duct tape and place it sticky side down on top of the piece of tape that is sticky side up. 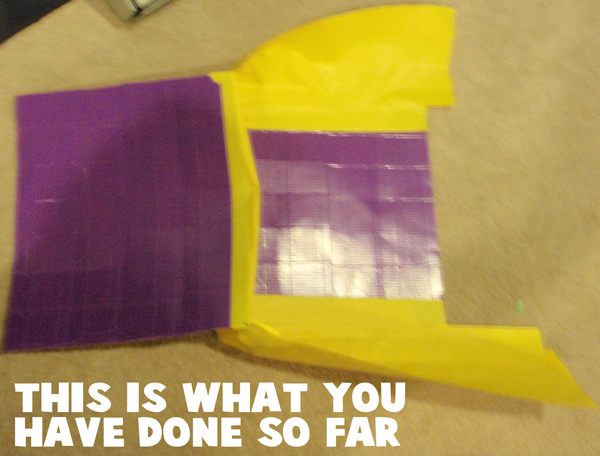 Keep going until your duct tape fabric is as large as you need it to be. Place the purple pieces, card side down. 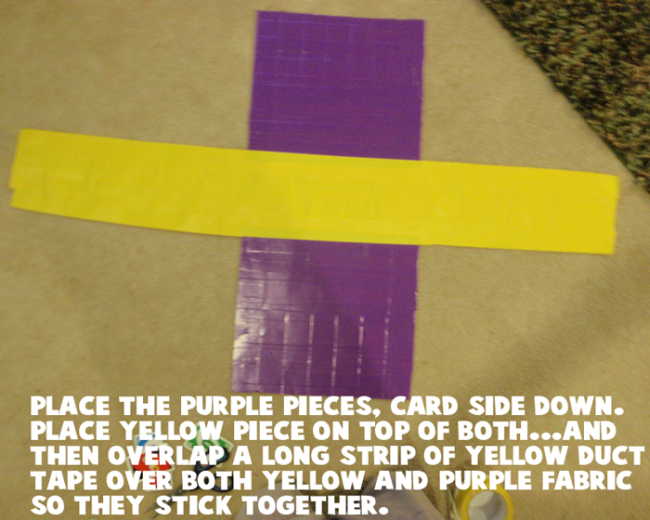 Place yellow piece on top of both… and then overlap a long strip of yellow duct tape over both yellow and purple fabric so they stick together. 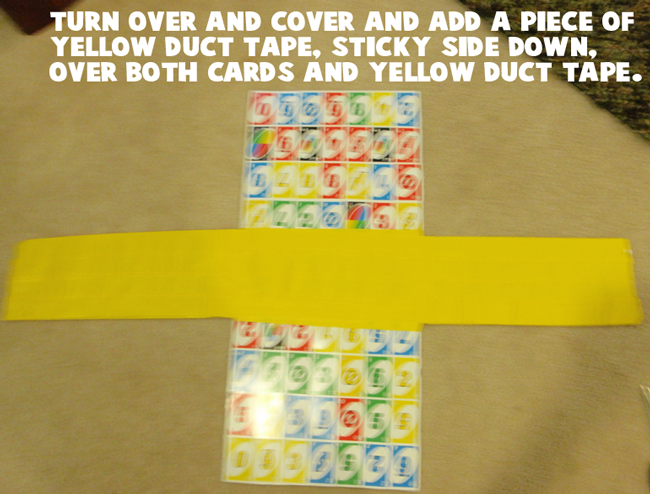 Turn over and cover and add a piece of yellow duct tape, sticky side down, over both cards and yellow duct tape. 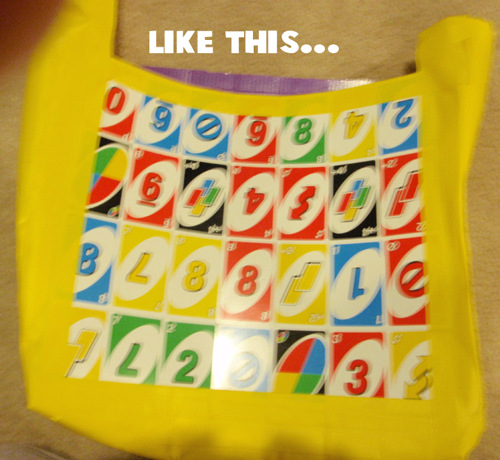 The yellow part will be the sides of the bag. 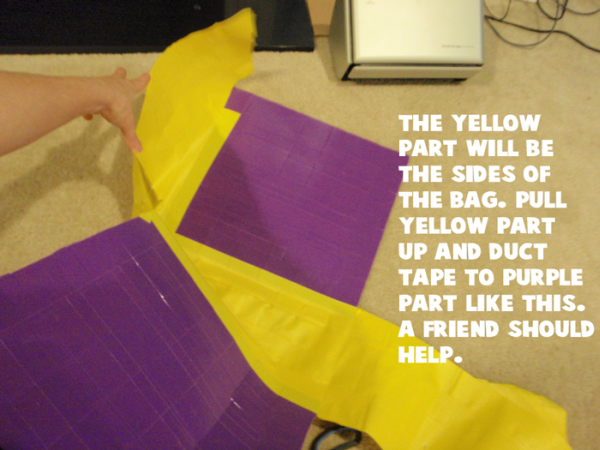 Pull yellow part up and duct tape to purple part like this. A friend should help. 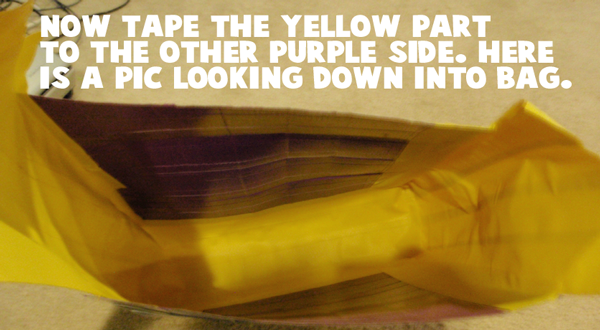 Now duct tape other yellow side up to purple fabric. This is what you have done so far. 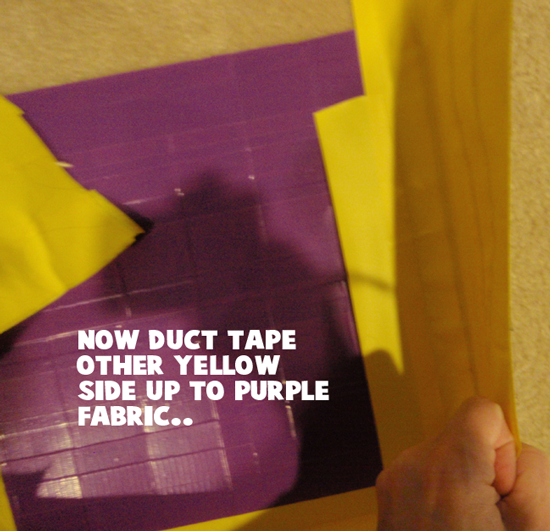 Now tape the yellow part to the other purple side. Here is a pic looking down into the bag. 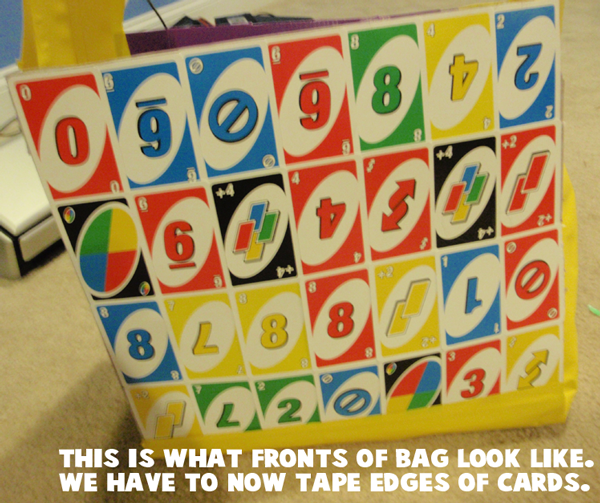 This is what fronts of bag look like. We have to now tape edges of cards. 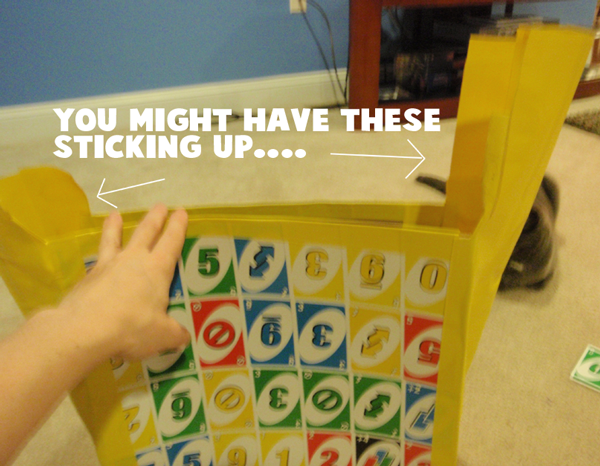 You might have these sticking up…. 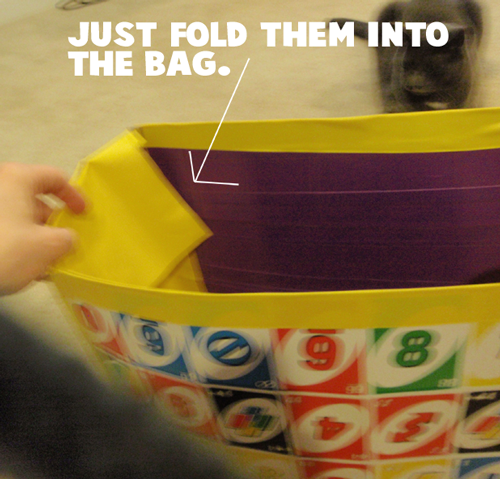 Just fold them into the bag. 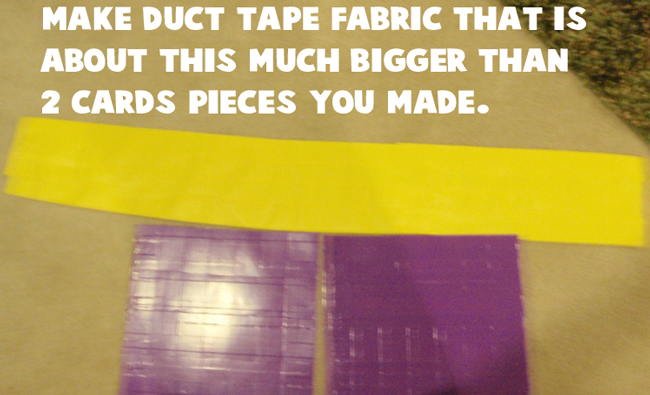 Make some more duct tape fabric…. make it long. This will be the handle. Nope…. even longer than this. 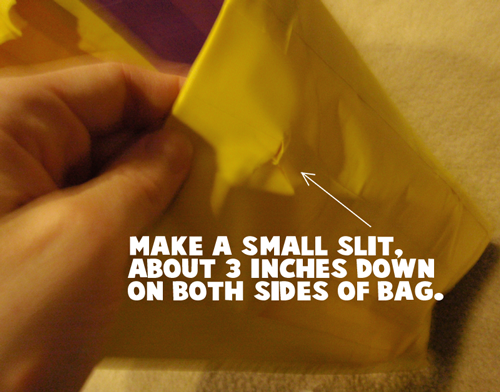 Make a small slit, about 3 inches down on both sides of bag. Duct tape all around hole so it won’t rip later. 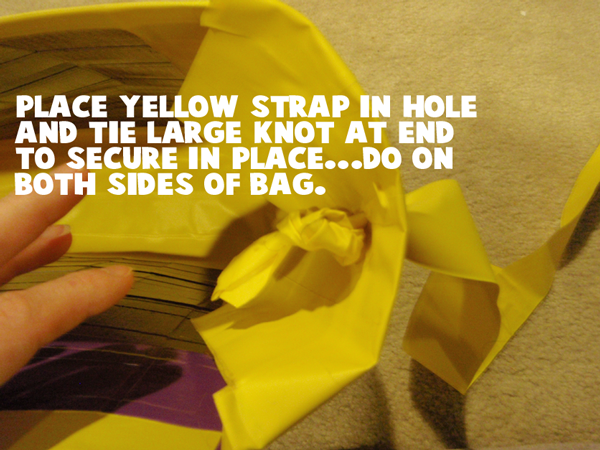 Place yellow strap in hole and tie large knot at end to secure in place…. do on both sides of bag. It’s done and ready to wear. 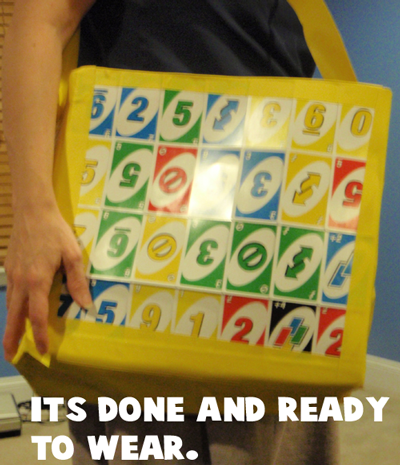 Isn’t this bag awesome? It is so big that you can pretty much hold in it whatever you wish. Enjoy carrying around this fun loving bag.